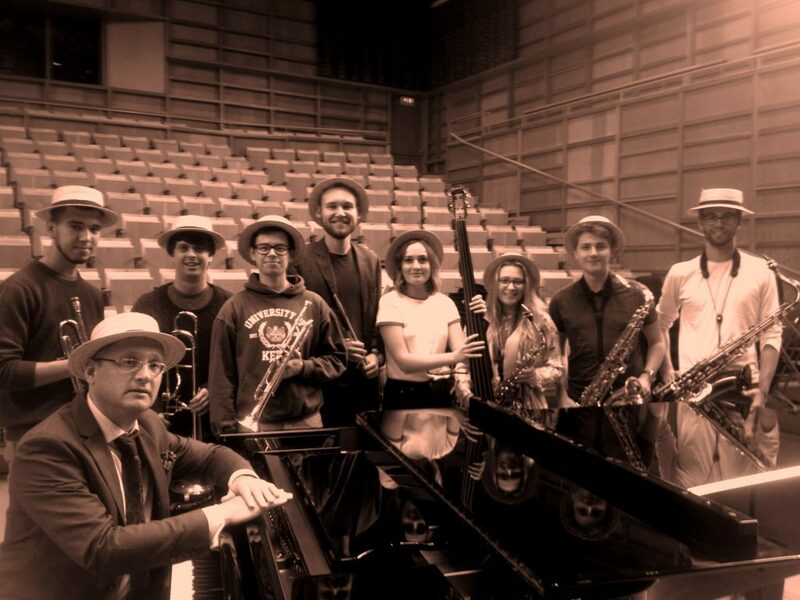 Jazz Booth | Music Matters | Because it does. Doesn't it ? 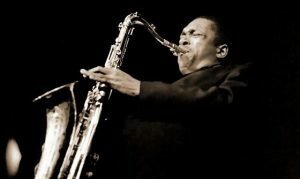 Happy birthday to the jazz giant and saxophone colossus, John Coltrane, born today in 1926. 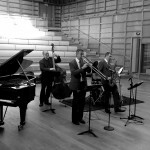 Legendary sideman, bandleader, endless searching to break new ground, Coltrane’s long shadow reaches beyond his untimely death from liver cancer at the age of forty, and embraces his time as sideman with Miles Davis to his own groups with figures including McCoy Tyner, Eric Dolphy, Jimmy Garrison and Elvin Jones to his increasingly experimental work with Pharoah Sanders, and late recordings with his second wife, Alice, as pianist. 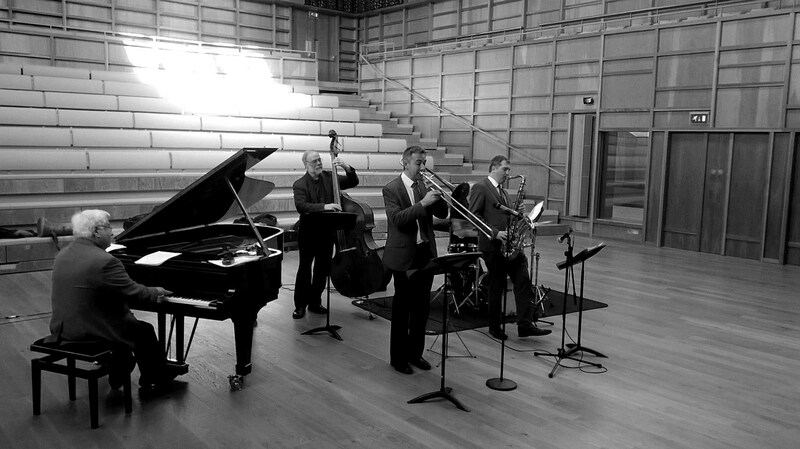 Difficult to choose a commemorative listening track, but I’ve gone with the opening to 1964’s Crescent; an exploratory, questing opening leads into a slow, stately articulation of the melody, punctuated by uneasy rumbles on kit, before stepping off into a brisk swing, fistfuls of McCoy Tyner’s colourful chords underpinning a bold, expressive improvisation from Coltrane that typically grows more expansive as it unfurls. 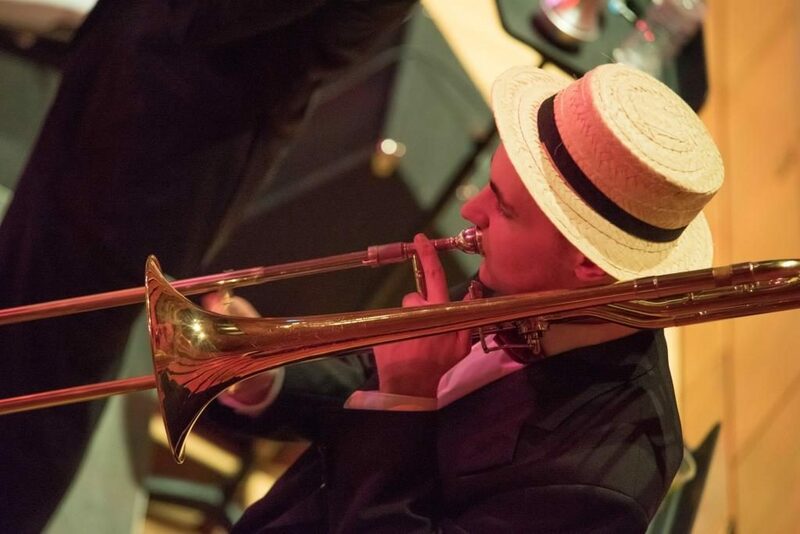 Happy birthday to a jazz great. 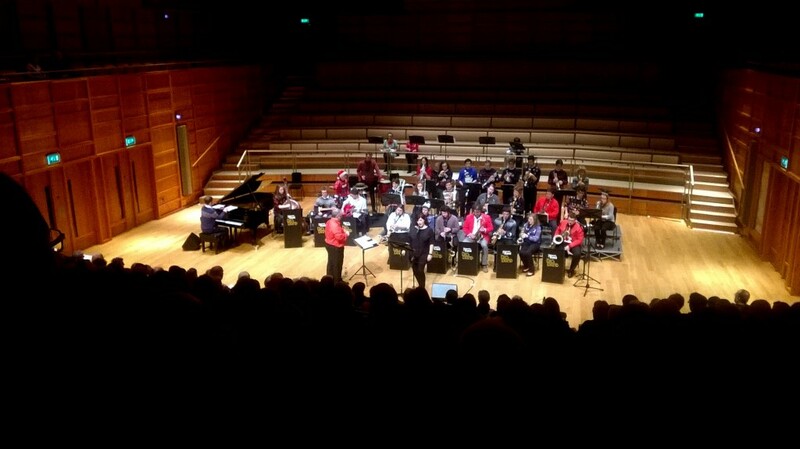 Colyer-Fergusson Hall was packed to the rafters yesterday evening, for the now traditional Christmas Swingalong featuring the University Big Band. 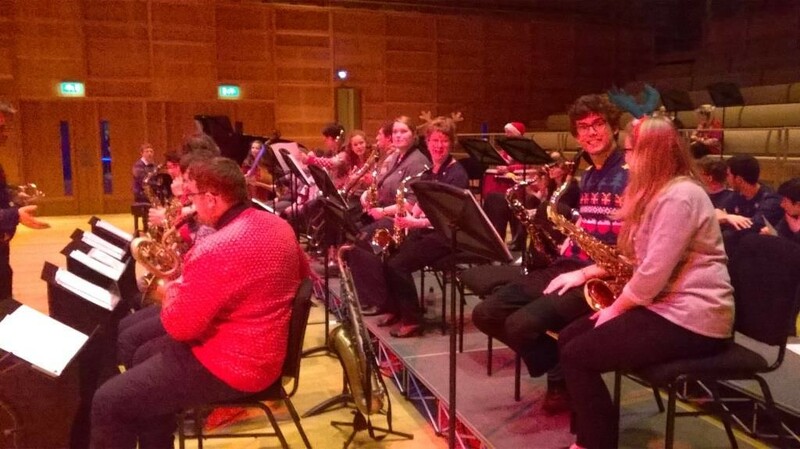 Led by a charismatic Ian Swatman, the band launched into a festive programme of popular favourites, including a sassy rendition of Santa Baby from our very own Music Administrator, Sophie Meikle, who sashayed from the percussion section forwards to deliver a teasing performance. 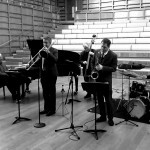 Elsewhere, first-year Doug Haycock crooned his way through Nat King Cole’s The Christmas Song, and saxophonist Peter Cook joined Sophie later on to sing Baby, It’s Cold Outside, in which both singers were clearly having far too much fun. 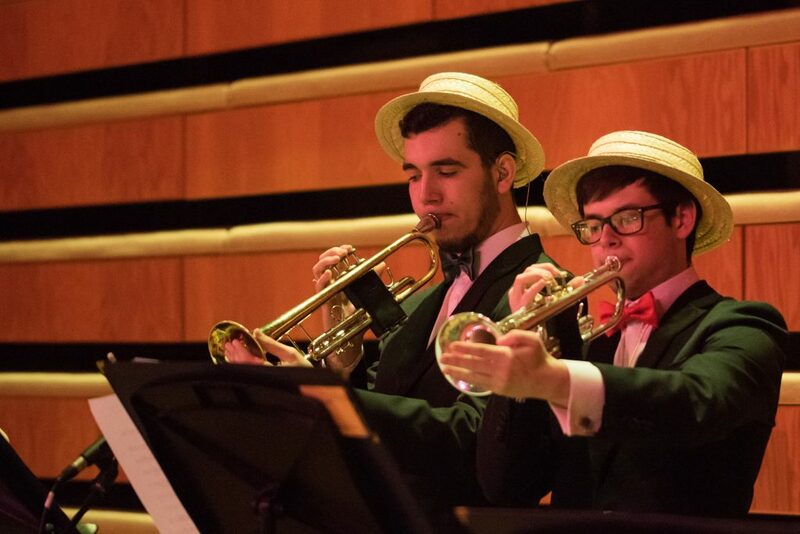 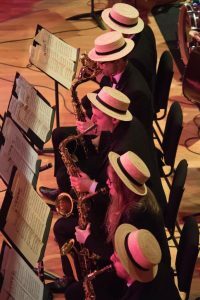 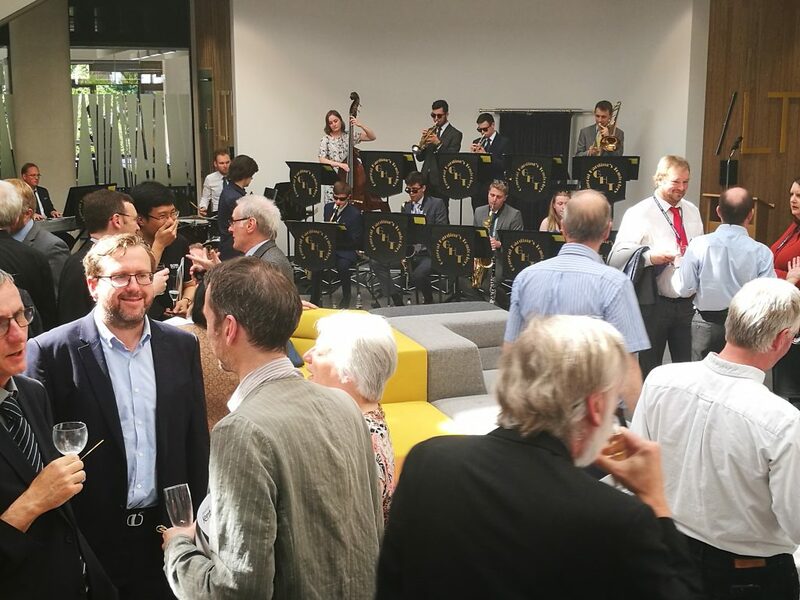 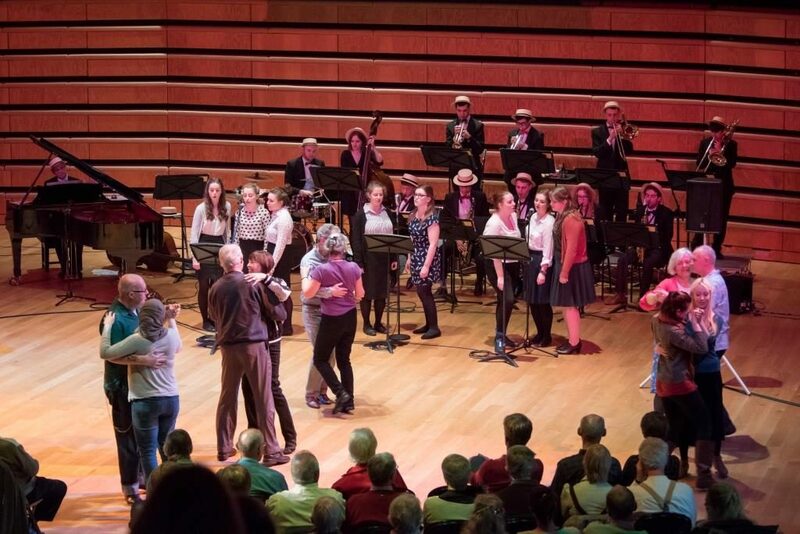 The Big Band’s Christmas gig is always a favourite amongst audience and players alike, with a vibrant and celebratory atmosphere drawing the department’s term of music-making to a close. 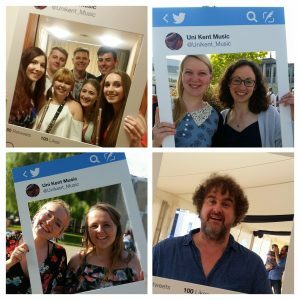 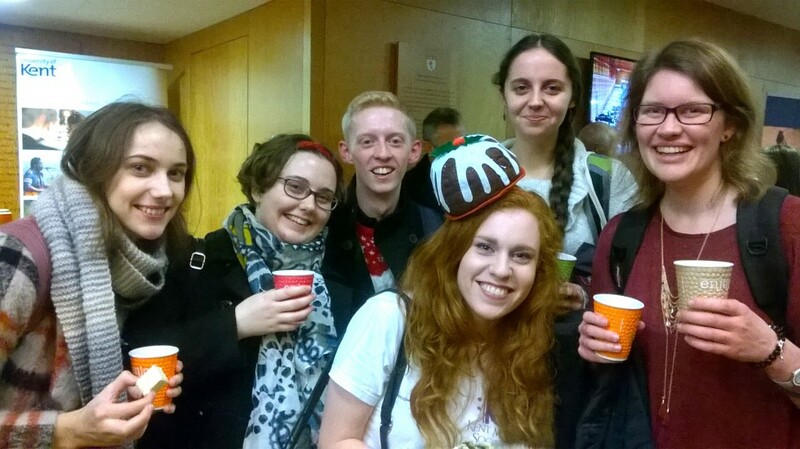 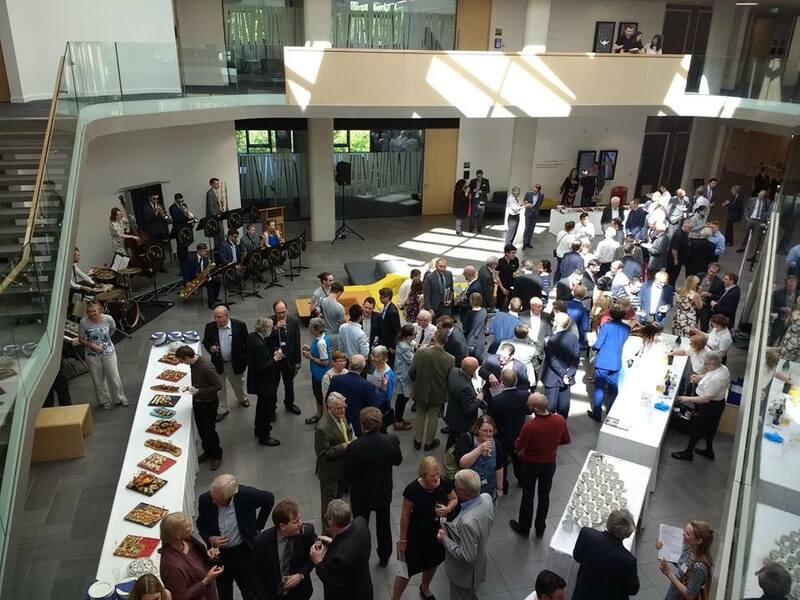 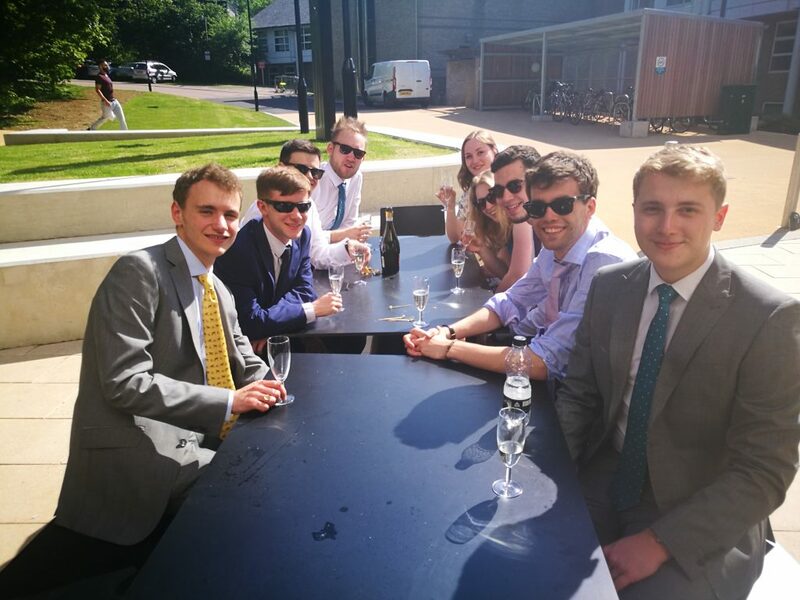 It’s been a terrific term; on behalf of the team here, huge thanks to all the students, staff, alumni and external members for your commitment and participation over the course of the autumn – we couldn’t do it without you. 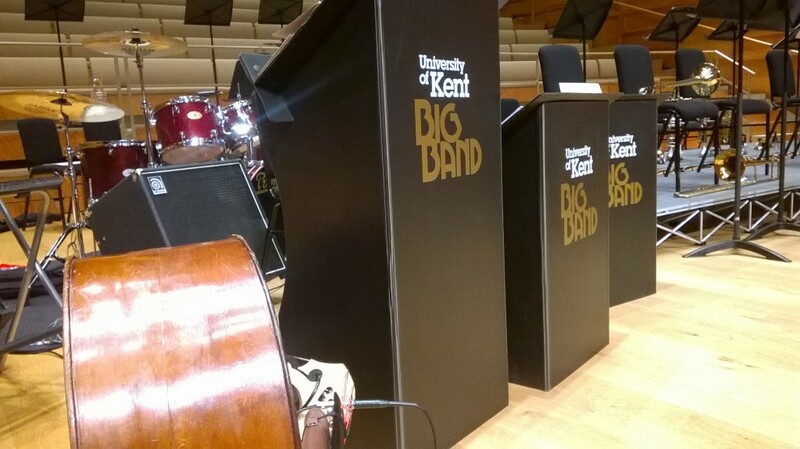 And as the sound of the Big Band recedes into the distance, it simply remains for me to say, as the band themselves did last night; have yourselves a merry little Christmas! 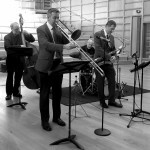 Fantastic gig this lunchtime from the Geoff Mason Quintet. 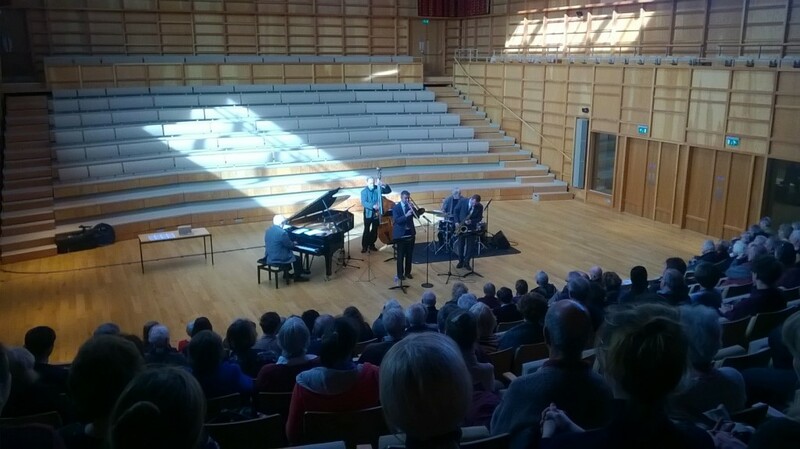 A bustling set opened with One By One, which included some fleet-footed, cascading improvisation from Simon Spillett on tenor sax. 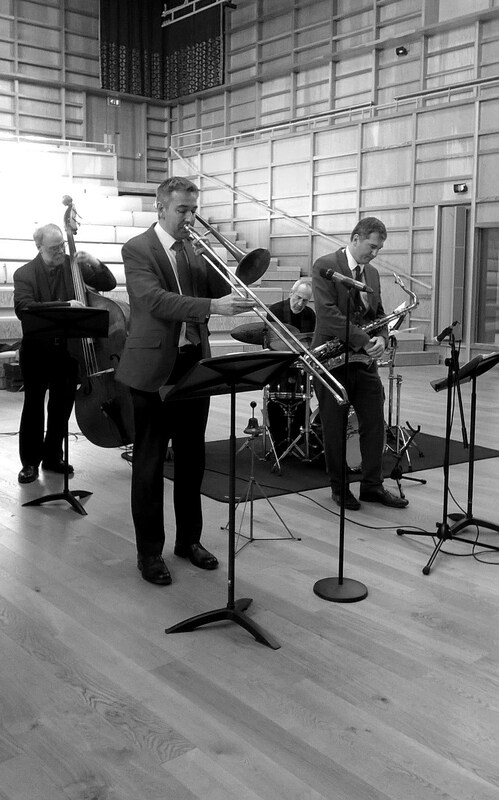 A lyrical waltz by the late Kenny Wheeler called forth some colourful piano-playing from John Horler, answered by a nimble bass solo from Tim Wells. 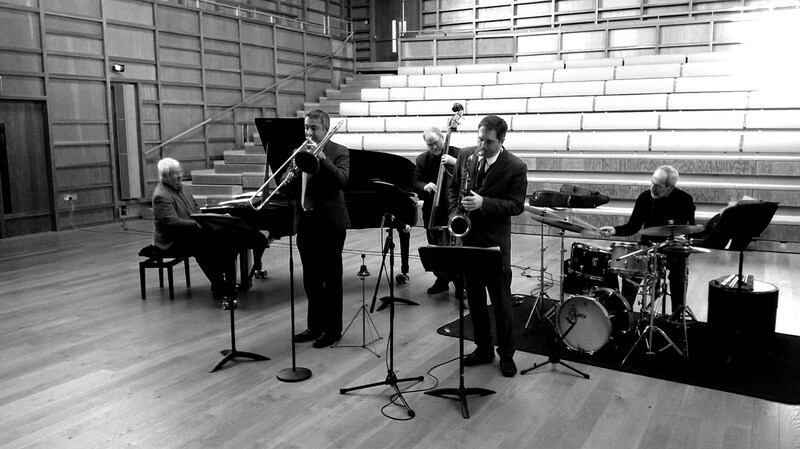 A white-hot reading of Monk’s Hackensack saw some blistering improv again from Spillett, underpinned by solid bass Wells, each in turn supported by some deft and inventive drumming from Trevor Tomkin. The high-octane set came to a close with McCoy Tyner’s robust Blues on the Corner, which was greeted by an enthusiastic reception from a large audience. 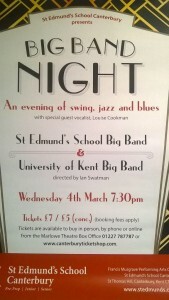 Our next unchtime concert is Weds 1 April. 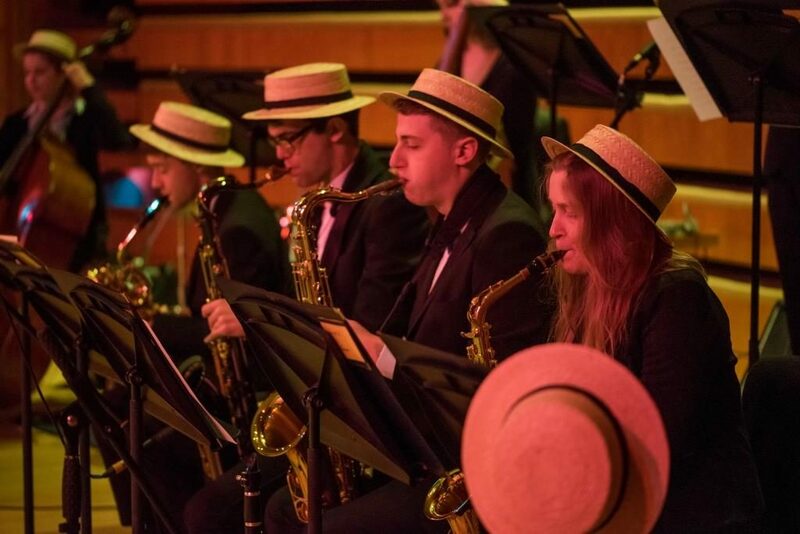 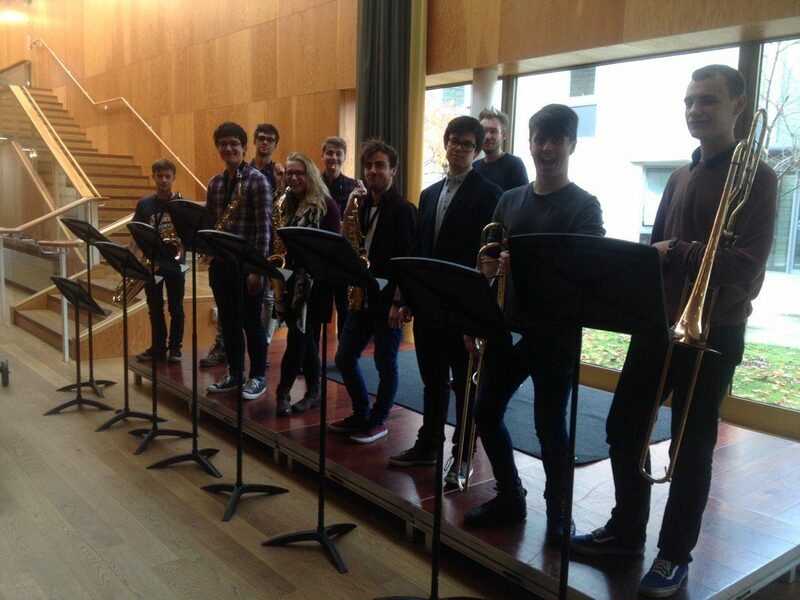 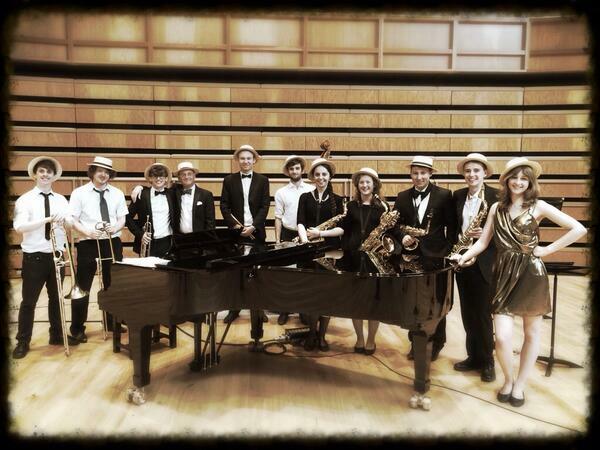 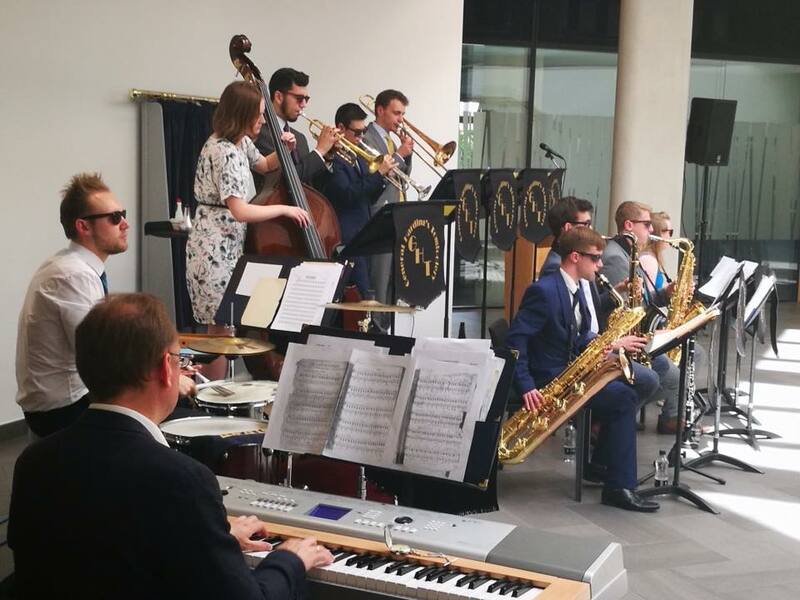 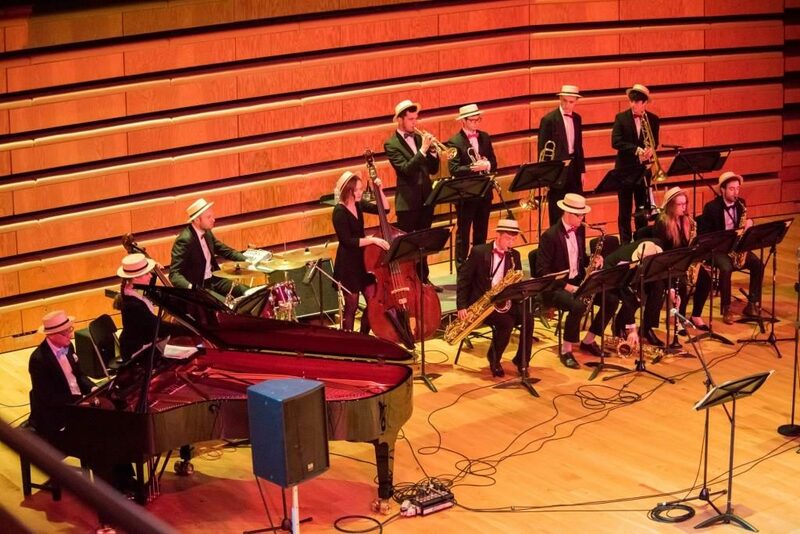 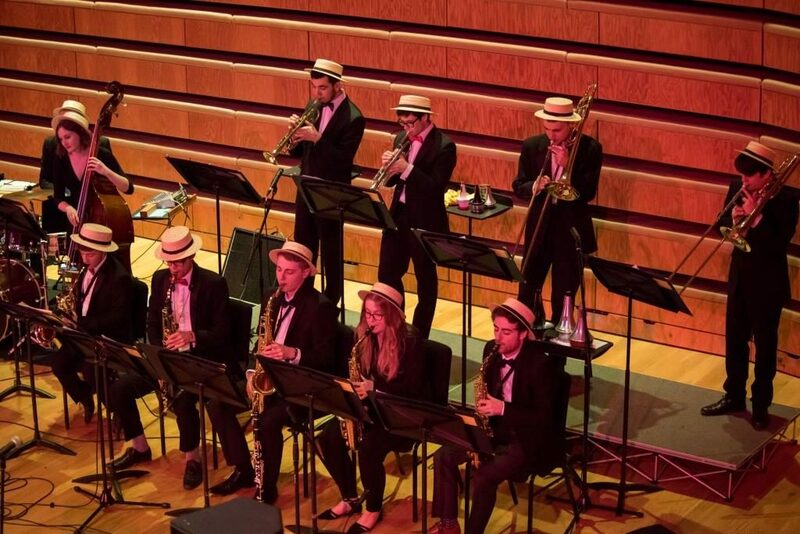 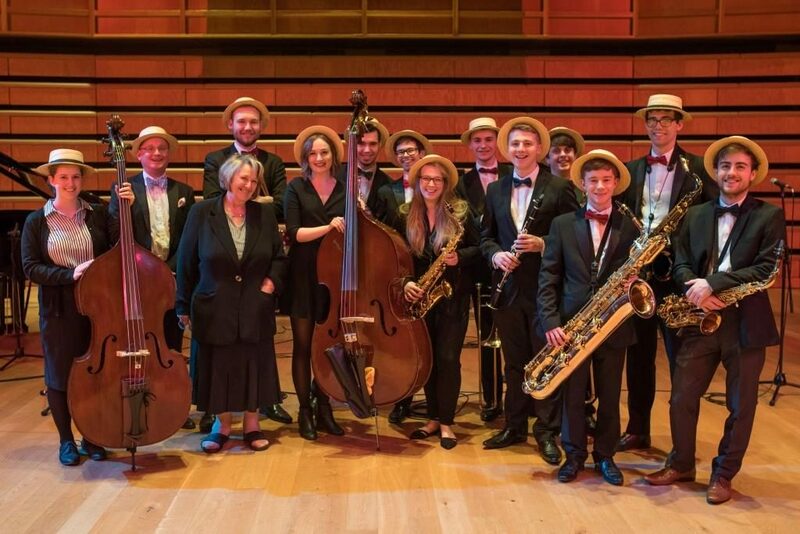 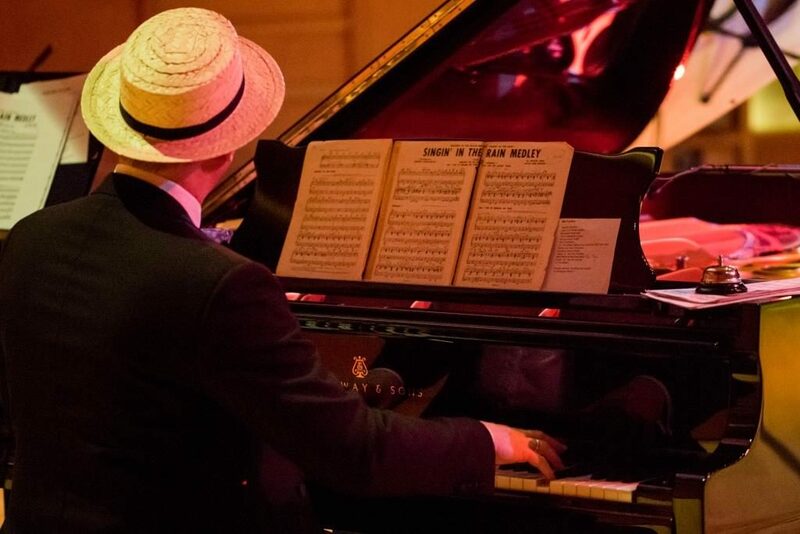 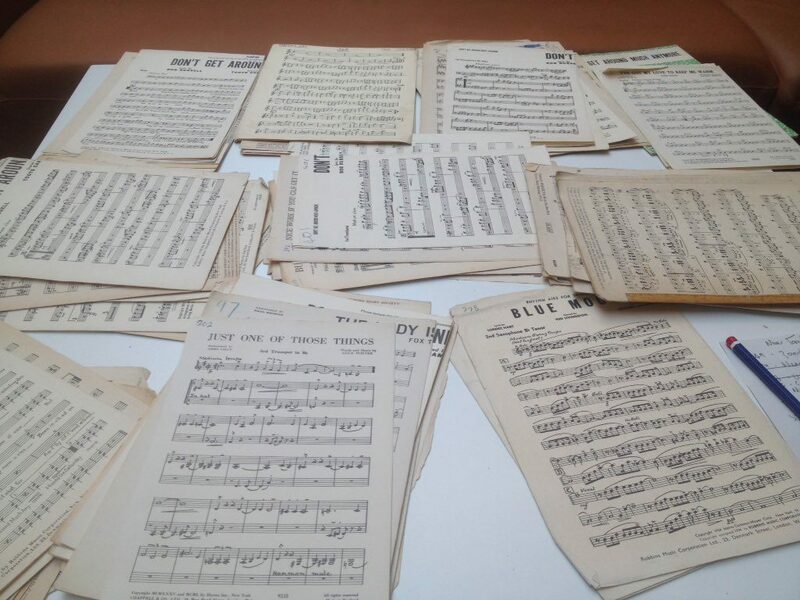 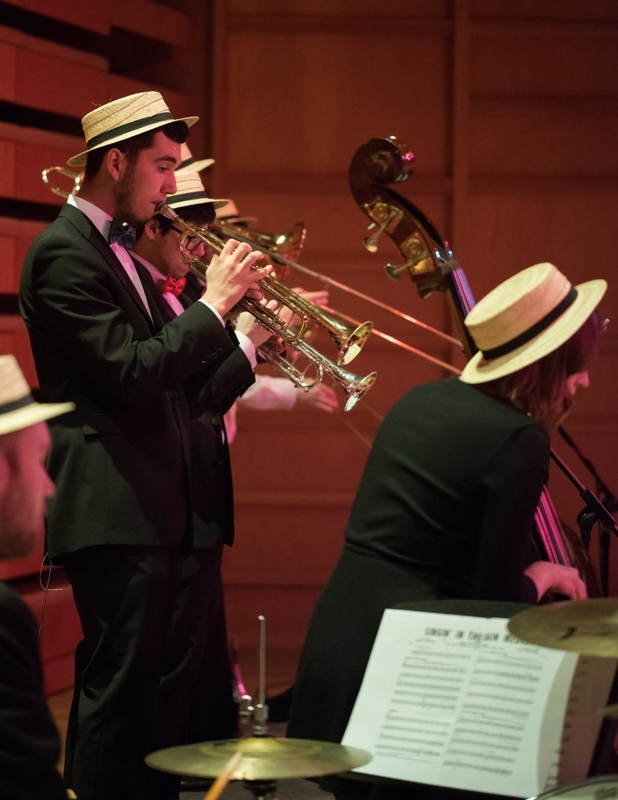 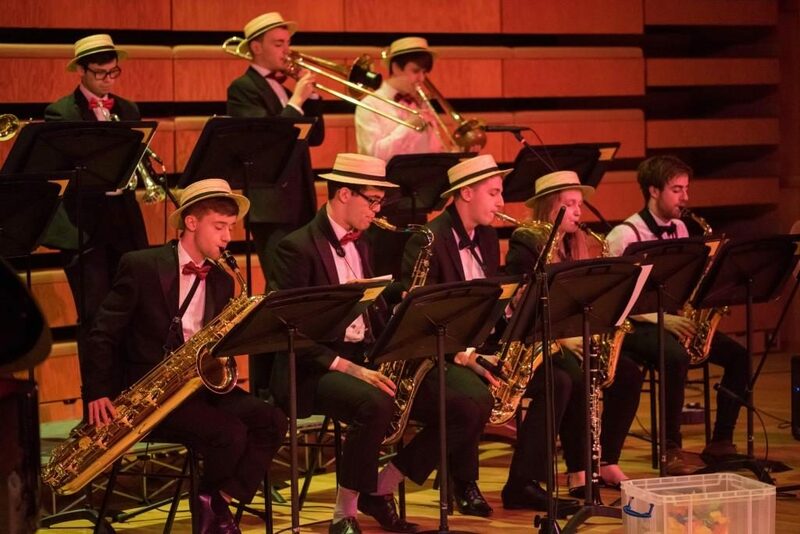 Fresh from its roof-raising gig here last Friday, there’s no rest for the University Big Band as its takes its dancing-feet down the road to St Edmunds’ School, where it joins forces with the St Edmund’s School Big Band for a rollicking night of jazz, swing and blues this Wednesday night. 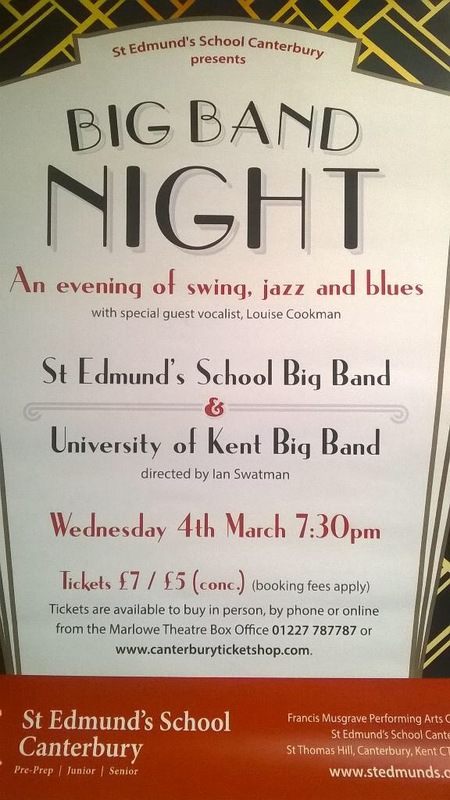 Fearless captain Ian Swatman will once more be at the helm, and vocalist Louise Cookman will return for what promises to be a lively evening; tickets are a mere snip at £7 / £5 concessions, available from the Marlowe Theatre Box Office or Canterbury Ticket Shop here.